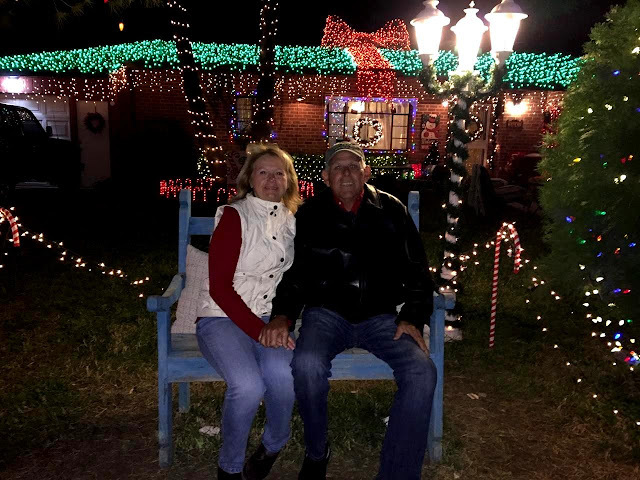 From Tucson Lazydays KOA We are in Tucson, Arizona for a total of eleven nights where we'll celebrate Christmas and ring in the new year. We like the campground very much even though it is not in the best part of town. The sites are nice, wide and each has a citrus tree. Pam and Ernie's is a lemon tree, loaded with beautiful huge lemons. Ours is an orange tree but all the fruit is picked already. The campground streets are paved and have 12" concrete curbs (the kind Lexie likes to walk on). The sites are gravel with a good sized concrete patio. Two large carport type structures cover entire rows of campsites. On top of each giant carport, solar panels are mounted making these sites "premium" for the hot summer months here. Right now, most of them are empty. That's us on the left -- Pam and Ernie to our left. Our site with our bare orange tree. Our first full day in Tucson, Pam and Ernie struck out in search of Christmas decorations and carols. Wayne and I took a ride too, but not in search of holiday spirit. We were just riding to see what downtown Tucson held. We happened upon a restaurant I'd read about late last summer. It's the oldest continuous operating (by one family) Mexican restaurant in America. The name is El Charro Cafe. I want to eat there while we're visiting Tucson but Wayne's pretty burned out on Mexican. We will have to wait and see. El Charro Cafe. Wish my friend Joyce was here to eat Mexican with me. The same afternoon we found El Charro, we stumbled onto Tucson's Old Town Artisans historic district. It's a tiny square of old buildings. For an hour or so we wandered among the imported wares, local arts and galleries. A most unusual display caught my eye so I photographed it for inclusion here. The small note tucked among the objects is inscribed, "This is a family day of the dead altar. Please do not handle items on the top shelf." Seemed odd to have a "Day of the Dead" altar in a store.... but that's just me. Pam, Ernie, Wayne and I had Christmas Eve dinner together at Longhorn Steakhouse Restaurant which was relaxing and the food was good. I sipped on a particularly good margarita filled with crushed berries. 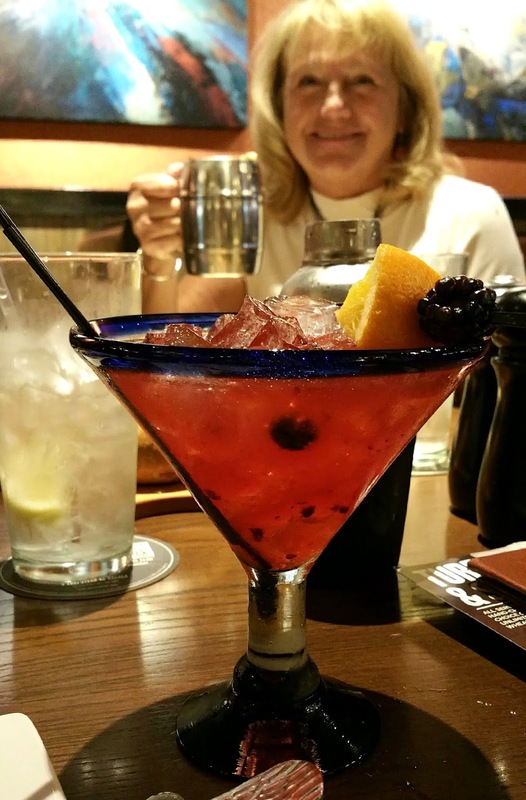 My berry margarita concoction. Pam in the background. The Tucson Lazydays KOA hosted a Christmas Day potluck dinner which the four of us enjoyed despite the cold temperature that came in last night. The campground provided luscious Christmas ham and wine while campground guests brought a dish to share. Pam made a cake; I took deviled eggs. Our table seated six couples and we had a good time despite being cold. 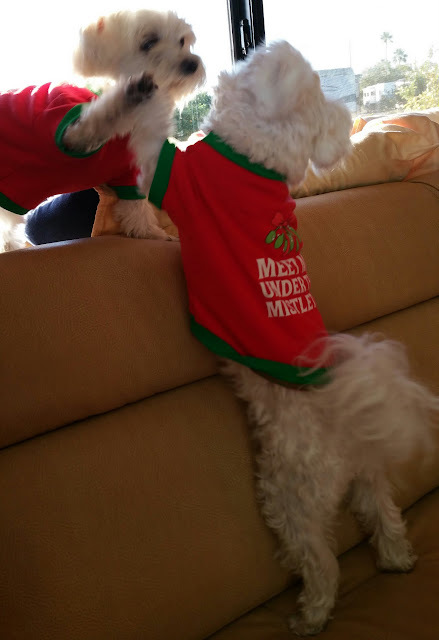 Lexie and Ozzie were in the Christmas spirit today too as they wrestled all over the living area of the coach. It's fun to watch their antics and we can't help but remember how timid and emotionless Lexie was when we first got her -- five years ago on December 4th. Ozzie is a trooper of a little guy. A rescue too, he was much less damaged than Lexie and he has taught her so much. Lexie on the window sill. Ozzie standing on the sofa. By mid-afternoon Lexie had taken her favorite spot at the end of the sofa for a nap. After the Christmas potluck dinner, Wayne and I were in for the evening, but not Pam and Ernie. They learned of a neighborhood spectacle of Christmas lights and went to see it. Pam sent this picture to me via text. 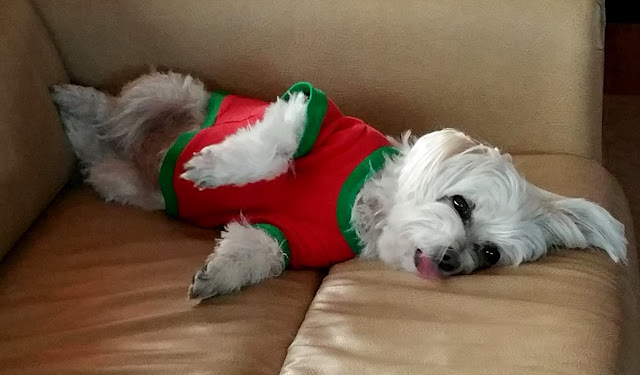 No, I did not envy her. I was warm in my pajamas by this time. Pam and Ernie, our travel pals. 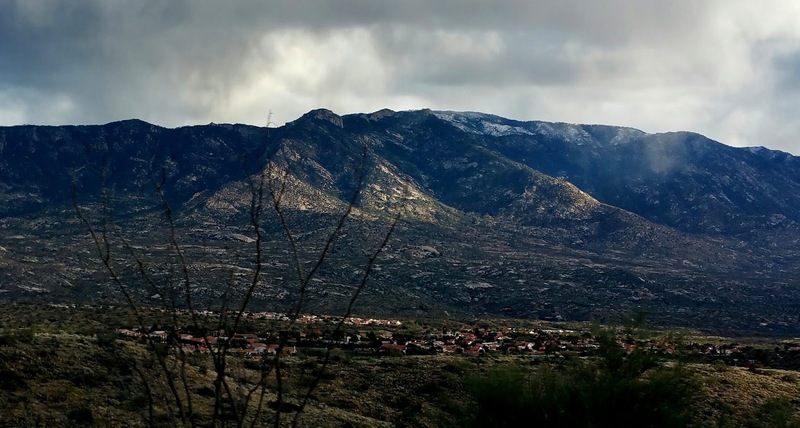 The Day after Christmas ---- South Arizona weather is downright awful today -- cold and overcast with only a smattering of sunshine to tempt us out for a ride into the foothills for a pizza lunch and then on into the Saddlebrook area just west of Mt. Lemmon. There are new homes there and we toured a few models to kill a cold afternoon. Had a good time, but no interest in a sticks and bricks (or stucco) house for us right now. Still enjoying the RV life too much to even consider it. 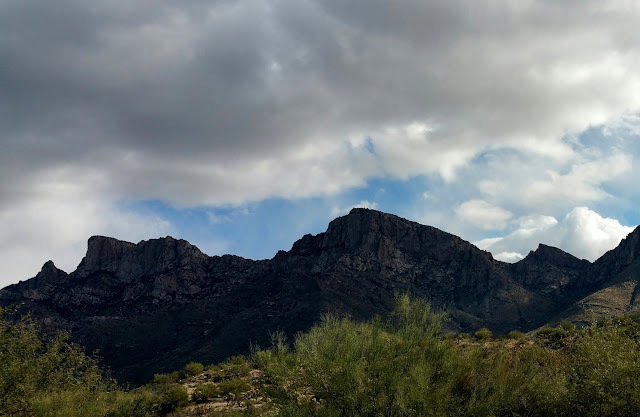 The following three pictures are some scenes from the Santa Catalina mountain range I took as we drove to and from Saddlebrook. The ominous, low hanging dark clouds tell the whole weather story. Mt. Lemmon is in there somewhere I suppose. Haven't really identified it yet. 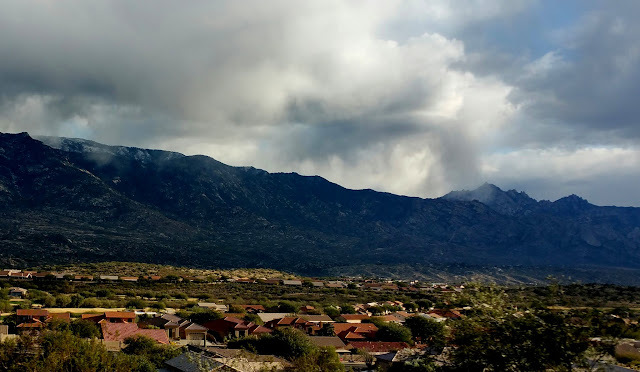 Thar's snow in them thar hills!